While we are at Gamla, a tel north of the Sea of Galilee, studying the Zealot movement, it began to dawn us why it was so hard for the Jews to recognize Jesus as the promised Messiah. We always are mystified that the Jews didn’t recognize Jesus for who He was and didn’t understand his message or movement. A closer look at the historical events during this time period and what life was like under Roman rule will reveal to us that we are too hard on the Jews and in fact, we would probably have been just like them. First, put yourself in the Zealots place. They are a very fervent, God fearing group of people that are disturbed at their countries downward spiral into the grips of Hellenism. Even God’s priesthood has become corrupt and the populace is slipping more and more into the Roman lifestyle. The Romans themselves are making life miserable for the Jewish population. Taxes are over 50%and there are crucifixions every week. They can make you carry their pack and can come into your house at any time of the day or night and make you feed them. The Zealots were desperately looking for a Messiah that would come and deliver them out of the hands of the Romans and lead them back to being a God fearing nation again. Then, along comes this man from the Galilee named Jesus who is drawing great crowds, healing the sick, raising people from the dead and feeding five thousand people at a time. This could be our man! They had even heard that Jesus went into the Temple and used a whip to drive out the buyers and sellers who were supported by the corrupt priesthood. John 2:17 says when the disciples saw this they remembered Psalm 69:9 that says,”Zeal for your house has consumed me”. This was one of the Zealots favorite scriptures! He’s one of us! He could be our guy! To add to the complexity of the situation, there was a huge debate going on in the two major rabbinical schools of thought of the day. They debated, “How will God’s Kingdom Come”? How will the promised Messiah come?” On the one hand, there was the prophecy of Zechariah 9:9 that said that the Messiah would come, gentle, riding on a donkey. God will take care of the Romans. We are not supposed to be violent .His Kingdom will come with His Power, not ours. On the other hand, in the same book (Zechariah 14:1-3), it says God’s Kingdom will come violently. To add to this, when they looked at their hero, the prophet Elijah, in his battle with God’ enemies, they read in 1 Kings 19:10 -“I have been very zealous for the Lord”! What had he just done in the previous verses? He had just killed 450 Baal Prophets by the sword! They also remembered the stories of all the patriarchs (Moses, David, etc) how they had triumphed over their enemies. They were sure they were right because it was in the text! Do you see that there was a stark contrast between Jesus message and the dominant mindset in Galilee? We’re supposed to love our enemies? Love the Romans? It was hard for anyone to get this message because everyone so desperately wanted the kingdom to come in great power and get rid of the Romans. Look at the disciples for an example. Luke 6:15 says that Simon was a Zealot and Judas was from Quiriot, one of the main Zealot cities. Peter carries one of the small knives that the Zealots were famous for. When the soldiers came, the disciples asked Jesus if they should fight with their swords. Peter used his knife to cut off the ear of one of the soldiers to try to fight back against the Roman guard. They only ran away when they realized that Jesus wasn’t going to fight back! Don’t you know they were thinking, “What’s he doing? We don’t understand our leader! Can you see how hard it would have been to believe that the kingdom would come at the lowest point of weakness? Now, let’s turn the table and point the sword at ourselves. Do we really believe that we can change our culture by loving our enemies and being kind to our neighbor? We don’t believe it, do we? We take our neighbors and fellow Christians to court to get justice. We are afraid to do something nice for someone because we are afraid they will take advantage of us. We’re Zealots!! We want God’s kingdom to come by power, elected officials, laws, etc. The truth is that His Kingdom Comes at the lowest point of weakness. Zechariah 4:6 says “Not by might, or power, but by My Spirit, says the Lord”. 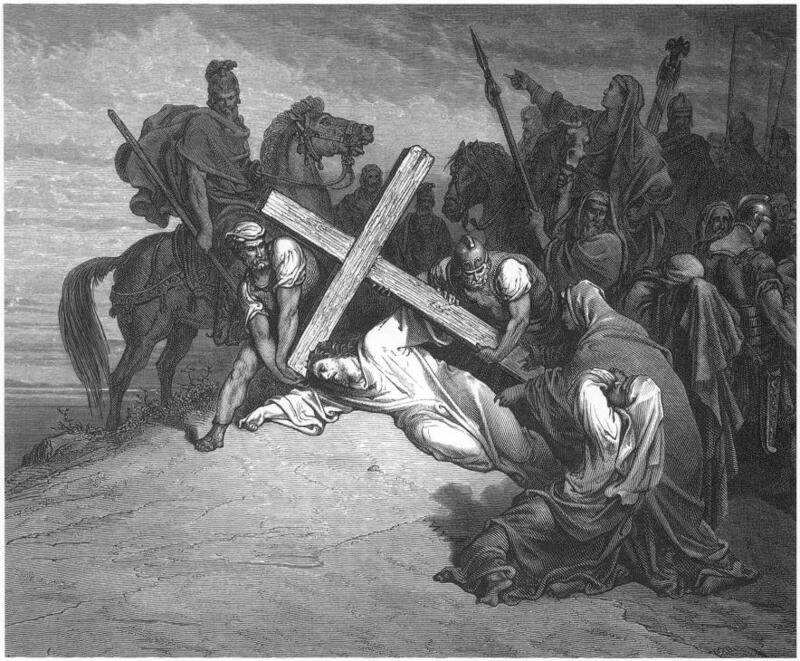 Jesus’ death, that lowest point of weakness, ushered in His Kingdom, the greatest power. His Kingdom now comes when brothers and sisters dwell together in unity, where we love our neighbor, consider others better than ourselves, wash feet, care for the poor, be meek, be a servant, be a sacrifice, be number two instead of number one. It is impossible to have the Kingdom of Heaven without the church (community) operating in this manner. If you are seeking the Kingdom, you become a part of that community and you give sacrificially to them and they do the same for you. You can’t love your enemy apart from community. It doesn’t just fall out of the sky so that you can do it individually. People have their hunger and thirst satisfied through community. Doing this study has helped me to realize more what the kingdom of heaven coming down to earth really is. As we learn to obey his will, and live a life of putting others first and living sacrificially, his power will be evident in our community and his Kingdom will come through us. Amen and Amen! Our climb to the top of Mt. Carmel on the first day of our trip to Israel was a difficult one. It is a very steep mountain and takes a lot of effort to make the 4 mile climb to the top. Mt. Carmel rises abruptly out of the plain of Jezreel and is the most prominent landmark in that whole part of Israel. 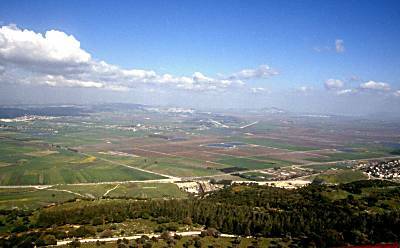 Once you get to the top of the mountain you have a breathtaking view of the Jezreel Valley and beyond. You can see the town of Nazareth, where Jesus grew up, across the valley. The Kishon River, which plays prominently in the story of Deborah and Barak and also in the Elijah story, is very visible as it snakes its way through the valley on its way to the Mediterranean. In the distance you can see the prominent landmarks of Mt. Gilboa, Mt. Moreh and Mt. Tabor. All these mountains have biblical stories associated with them. The ancient city of Megiddo sits at the eastern base of the Carmel Mountains, and this whole area is frequently called the Valley of Armageddon by Bible scholars. As you can tell from all the well known biblical names, this area is full of stories and imagery from the Bible. One of the stories we discussed, the story of Deborah and Barak that occurs in Judges 4 and 5, had some interesting ” I bet you didn’t knows” that make the story a lot more intriguing. The part of the story that the typical western reader would miss occurs in the names of the characters that are involved. “Deborah” means, “Honey Bee” or “Honey”. What does God taste like? Honey! Deborah definitely represents good in this battle between good and evil. “Barak” means “thunder and lightning”, “Boom”, “Powerful”! However, in the story, he didn’t really live up to his name. He told Deborah, “I’m not going into battle unless you go with me’! I’m scared!” Barak wasn’t a whole lot of thunder if he wouldn’t go to war unless a woman went ahead of him! The general for Jabin’s army was a man named Sisera. “Sisera” means “snake”. Who is a snake? The devil! Sisera and Jabin are the devil and represent evil in this story. What happens to Sisera (the devil) in this story? The woman, who killed Sisera, killed him by striking his head. If you go back to the Genesis story of the battle between Satan and God, it says that we will strike the devil’s head and he our heel. To an eastern thinker, this story was not just a battle between Deborah and Barak and Jabin and Sisera, but a much bigger battle between the forces of good and evil. God triumphed over the Devil in this battle through these early Bible characters. This story, as in many cases in the Bible, means a lot more once you know all the details. It turns out that there was a lot more here than originally met the eye! On the first day of our trip to Israel we spent a lot of the day following our rabbi climbing Mt. Carmel. Just as the disciples of our rabbi Jesus did, we listened and learned from him as we walked along the path. As we entered an ancient olive grove, he began to give us some intriguing background information on this interesting story of Jesus cursing the fig tree that is found in two of the gospels. Because of their size and abundance in Israel, the olive tree was thought of by the Jews as just an ordinary tree that represented ordinary people. Although they were the most important and productive tree in Israel, olive trees are not very tall and don’t create much of a canopy for shade. Almost every family had a grove of these in the family gan (garden). Fig trees however, were a much bigger tree and didn’t occur as often in the natural landscape .They were prized for their large fruit .Their scarceness, large size and shady canopy made the Jews think of the fig tree as the tree of royalty and leadership. If you had a large fig tree, you were shaded, protected and sustained by its presence. With this background in mind, it is interesting to review the two stories to see how this might have played a part in Jesus actions. In both accounts of Jesus cursing the fig tree he had argued with the leadership either just before or right after withering the tree. To an eastern thinking reader, this was a picture of what Jesus thought of the leadership that he had come into contact with and how he would handle their argumentative nature. To a Jew, it was no coincidence that he cursed a fig tree rather than an olive or some other tree. He was making a point with a scintillating picture to back it up. An interesting side note is that the two accounts of the same incident differ in what happened to the tree that was cursed. In the Matthew account, they saw the tree immediately wither, whereas in Mark, they came back by the tree the next day and noticed that it was withered. In either case, Jesus made his point to his disciples and bystanders as to what he thought of the corrupt segment of the Jewish leadership. P.S. Another fact I learned about trees on this walk, was the meaning of the phrase in Isaiah 55:12 that says, “The trees of the field will clap their hands”. This is a reference to the trees yielding their fruit and bearing a bountiful harvest. On that day, when we “shall go out with joy and be lead forth with peace, and the mountains and the hills break forth in singing”, the trees will yield their harvest to you and will produce much fruit. That makes those verses make a lot more sense. The story of Jesus’ confrontation with the Pharisees and Herodians in Matthew 22 is one of the better known and often quoted stories in the New Testament. Everyone knows that Jesus amazed the crowd with his answer to their question of whether or not to pay tribute to Caesar. When you understand more about the culture and put some background into this story, Jesus’ answer is even more amazing and it makes a huge difference in how the story is understood. First, read the story in Matthew 22:15-22. First of all, the fact that the Pharisees and the Herodians would cooperate on anything is worthy of note. The Pharisees were very religious and very dissatisfied with Herod and the Romans. The Herodians were very secular and enjoyed the prosperity and lifestyle that the ruling administration afforded them. The Pharisees often called the Herodians the “Lost Sheep of Israel”. However, in this case, the two parties were desperate enough that they agreed to work together to see if they could trap Jesus with a question that he couldn’t answer without alienating one or the other of the groups. The story hinges on two points: the word tribute and knowledge of the denarius coin that was used in the confrontation between the Pharisees, Herodians and Jesus. If you understand these two pieces of the puzzle, then you will get a great impact (Hebrew, “Shanon”) out of the story. Verse 17 in many translations says, “should we pay tribute to Caesar or not?” However, in some translations it says, “taxes”. Tribute is the correct word to translate here because during this time in history the tax and the tribute were two different forms of payment required by the Romans. The tribute was a special form of tax that the emperor required every subject to pay to him to honor him as God. It was not a large tax, maybe $100.00 or so a year in today’s money. Every nation that the Roman Empire controlled had to pay this tribute like you would tithe or pay to your own God. The Jews, during part of this period in history were given an exemption from paying this tribute because they were so passionate about their God being the one and only God. For a while Rome let them slide just because it caused so much controversy. Every nation paid this tribute to all the Caesars as a way of paying homage to their rank as one of the Gods in the Roman Pantheon. Failure to pay this tribute would result in death or imprisonment. Every Caesar minted his own coin or coins that would be used to pay this tribute to him. One Caesar minted eleven different coins just for this purpose. The important point here is that this coins only purpose was to pay the tribute to the Caesar. This coin was called the Denarius. The coin that Jesus asked to see and would have been looking at would have been the coin of Tiberius, the Roman Emperor that was currently in power. Many of these coins have survived and you can look them up on the internet to see what they say on both faces. The Tiberius denarius coin’s inscription is as follows: “Tiberius, Worshiped Son of the Worshiped God”. Tiberius, was the son of Caesar Augustus, the first Caesar to declare himself a god in a public way. Tiberius, through this inscription on his denarius tribute coin, was declaring himself to be God! With this in mind, in verse 20, when Jesus asked, “Whose portrait and whose inscription?” the audience already knew that the coin claimed Caesar was God. When Jesus said, “Give back to Caesar what belongs to Caesar” (go ahead and pay him his tribute because he is in authority over you), “but give to God what belongs to God”, he was separating the two, God and Caesar! Caesar and God are two different things – Caesar is not God! This answer sent a shock wave through the listeners! Jesus satisfied the people that didn’t want to acknowledge him as God, but he also satisfied those who thought that the tribute should be paid. The Pharisees, Sadducees, Zealots and Herodians couldn’t criticize him for his response. It was the perfect answer and left them all with their mouths open. “When they heard this they were amazed and they left him and went away”! This story is such a perfect example of how knowing the culture and customs of the day make the Bible so much more interesting. Without knowing all this background information, you still know that Jesus did a wonderful job in confounding the great thinkers of his day but knowing these cultural facts makes the story jump off the page. While it doesn’t really change the meaning of the story, it sure makes his point so much richer! Don’t we serve and awesome and inspiring God!! P.S. An interesting side note to this story is found in David Stern’s, “Jewish New Testament Commentary” on this story in Matthew 22. The Bible translators left out the first word of Jesus reply to the Herodians and Pharisees. The first word Jesus spoke was the Yiddish word “Nu” (Greek-OUN). Jesus says, “Nu, give the emperor what belongs to the emperor”. “Nu” is an all purpose Yiddish word that is similar to our word, “Duh!” Jesus is saying, “Duh! Can’t you figure this one out for yourself?” This one little word really conveys the tone of Jesus reply to his opponents and shows you how soundly he handled this confrontation and made them look bad. This was really an eye opener!